Last Saturday, after a long day of flooring shopping and other errands, we were not in the mood to cook. We were back home in Robinson, and none of the chain restaurants really appealed to us nor did we feel like driving into the city. We called Bravo and there was a 45-60 minute wait. It was already 6:15 pm and we were hungry! This is just one problem with the chains in Robinson - you cannot go at dinner time (6-7 pm) and get a table in a 'reasonable' amount of time. There's always a long wait, everywhere, it seems, and sometimes that's very tough for us because of SP's diabetes (there are a lot of times that he needs to start eating candy while we are waiting for a table at 6:30 pm because his sugar is dropping) and me, well, sometimes I get really hungry and I just don't want to wait. 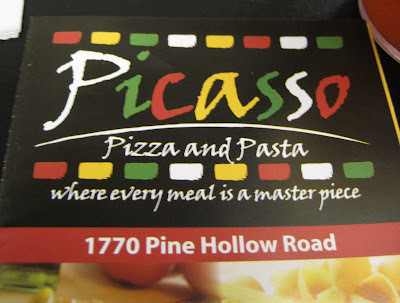 So we decided to try a pizza place near SP's dad's new house, a place for which we received a menu in the mail because they deliver to our house (but also they have dine-in seating) so that's how we heard about them: Picasso Pizza & Pasta on Pine Hollow Road in Kennedy. There are about 9 tables for 4 in the dining area. 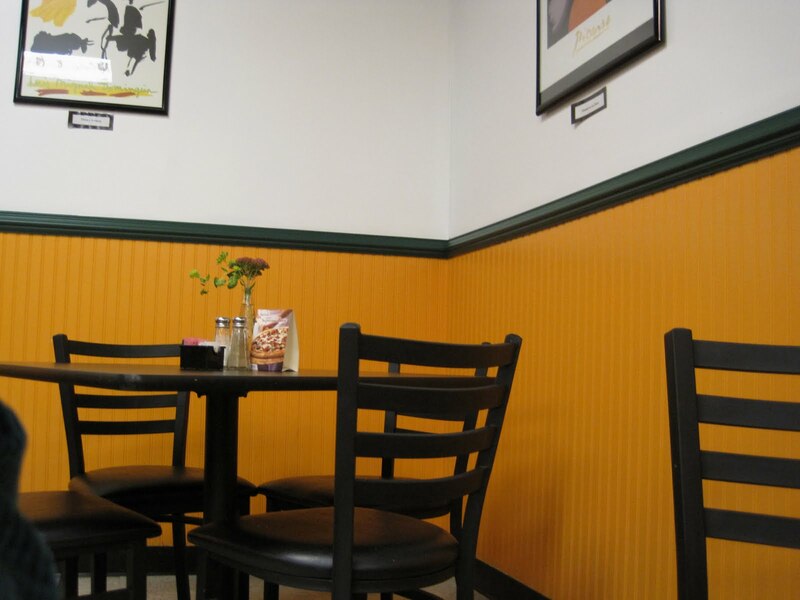 The walls are bright orange with a dark green chair rail and white on the wall above the rail. There are framed posters of Picasso works on the walls. Despite having that pizza shop vibe with the bright overhead lighting, I felt comfy and cozy in the dining area. There were several other tables occupied with older, 'suburban' couples and friends, some of whom had attended the Pitt game earlier in the day. The dine-in menu is a huge piece of paper - like poster sized! - with options on both sides. We both ordered iced teas and were happy to discover that the iced tea is freshly brewed. It even says so on the menu: "Homemade Unsweetened Iced Tea." There's also a "Fresh Squeezed Homemade Honey Lemonade" that sounds yummy - but they do charge extra for refills on the lemonade. You can also take a bottle of wine to enjoy with your food. 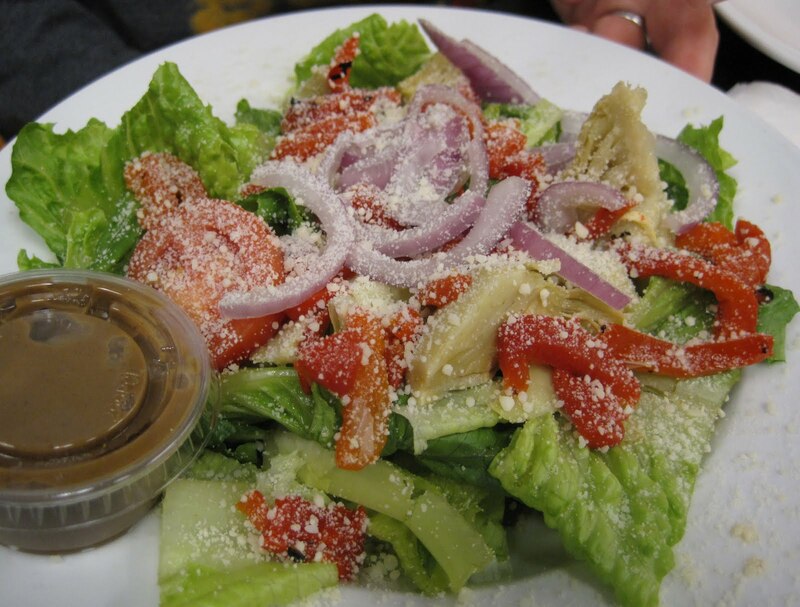 SP started with Picasso Salad (romaine lettuce, artichokes, roasted red peppers, tomatoes,red onions, balsamic vinaigrette dressing and parmesan cheese): I think the dressing had been in a very cold refrigerator because it was kind of solidified, but for us that was OK because we don't like a lot of dressing. The romaine was crisp & fresh and there were lots of the 'good bits' (the artichokes and peppers, etc.). It's nice that in the salad descriptions on the menu, the type of lettuce is specified. There are romaine salads and iceberg salads and a spinach salad. I almost expect salads these days to always be mixed greens, not iceberg, and always end up disappointed with iceberg salads so I am glad that one can 'be prepared' for iceberg lettuce. 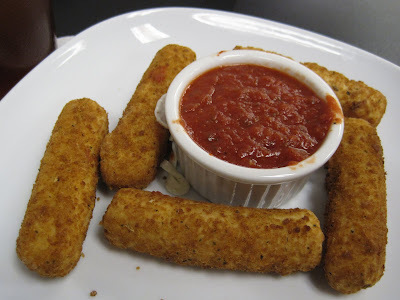 The salads are served with a slice of garlic pizza: I ordered the Mozzarella Sticks with homemade marinara sauce: I love cheesesticks. They are a comfort food to me. These ones were large, the breading was plain but not tasteless, and the marinara was very tasty. They were piping hot when they were served and I burned the roof of my mouth! It's good that they were served so hot. I don't like when my cheesesticks are cooked and then show up kind of lukewarm and solid. These were super hot and ooey & gooey. We decided to try two of the Gourmet Pizzas. 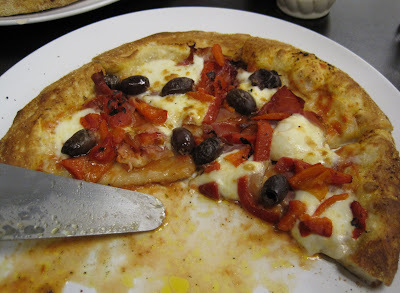 Our first choice was the Sicilian (very light tomato sauce, fresh mozzarella, prosciutto, roasted red peppers, kalamata olives, drizzled with Italian olive oil): This pizza is a very thin crust pizza and this was a very wet pizza. You can see how wet the plate is. It was very tasty and didn't taste soggy, it was just wet, and the toppings a bit heavy for the thin crust (but how could toppings not be heavy on a thin crust?) 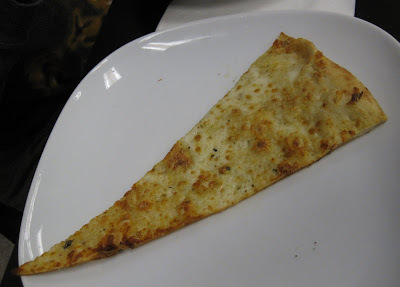 so I folded my pizza slices in half to keep them from drooping and falling apart. Our second choice was the Garden Veggie Pizza (tomato sauce, green peppers, onions, black olives, mushrooms, tomatoes): This was not as wet as the Sicilian, but I still folded my slices in half. This was very tasty. 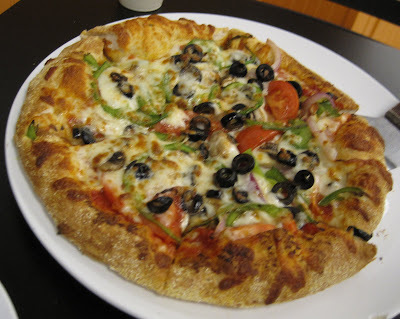 I really like green pepper, olives, & mushrooms on pizza. We both enjoyed this one a bit more than the Sicilian. We ate half of each pizza and were stuffed. I was sad to be so full because I really liked the sound of the dessert list: cannoli, tiramisu, and fritta (fried dough). They also serve Cheesecake Factory Plain Cheesecake. 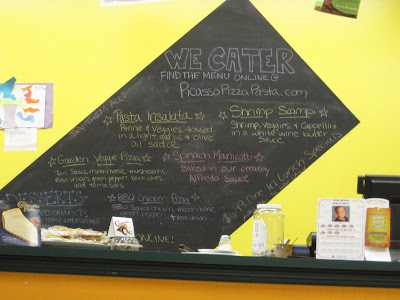 I'm not sure there is such a thing as 'best pizza' and it really depends on your personal preference. Me, I like a lot of different kinds of pizza. I'm not set on thin crust over thick crust or deep dish. I just want it to taste good and not like cardboard with jarred tomato sauce and fake, generic, tasteless cheese. 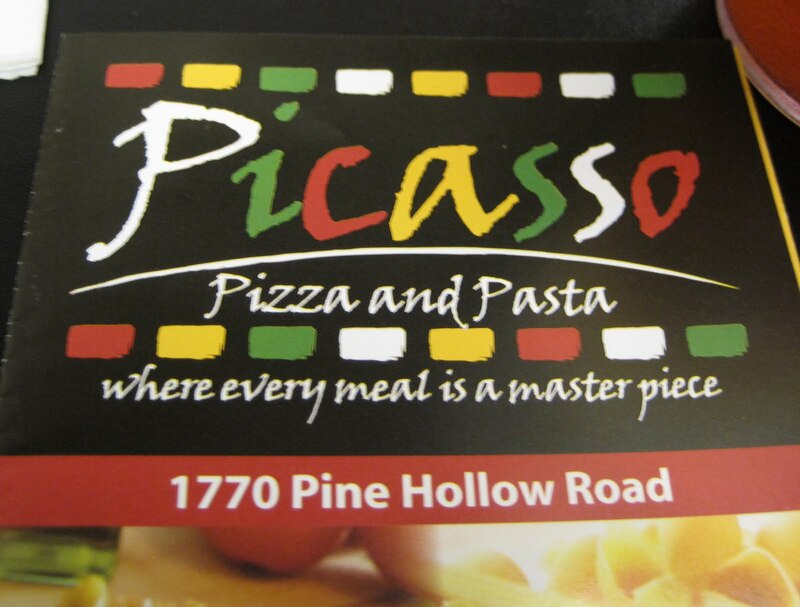 Picasso Pizza's pizza was very tasty and we would go back and order the pizza again. We'd also like to try some of the Gourmet Sandwiches. Our server was very friendly and kept our drinks filled and the table promptly cleared of dirty dishes. It would have been nice to have silverware on the table instead of having to ask for it, but... that seems like a minor detail at a pizza shop. She did bring lots of napkins over and since I am a messy pizza eater, that was much appreciated. Our food arrived at a nice pace - the pizza did not arrive right after the salad and cheesesticks. There was nice wait between finishing the salad/cheesesticks and the arrival of the pizza. Honestly, it was a really nice date night dinner! It was pizza, gourmet pizza, but not like being at Dinette or Il Pizzaiolo, it was very casual and relaxing, none of that hustle and bustle with tons of people waiting for a table like at the chains or that feeling that you need to order alcohol (I felt like that at Dinette, especially, I just wasn't in the mood for liquor but I felt like I had to... if that makes any sense). And after, we took home our leftover pizza and cuddled up on the couch, each with a cup of new tea (White Chocolate Mousse for me; Green Cherry Blossom for SP). This sounds like a great place! I always like to have some go to places in mind when you feel like eating out at the last minute on a weekend but don't have a reservation somewhere and don't want to wait forever for a table. The BYO sounds awesome too!